The Flaming Star Region, including the Flaming Star Nebula (Sh2-229, IC405), the Tadpole Nebula (Sh2-236, IC410), the Spider Nebula (Sh2-234, IC417), the Fly Nebula (Sh2-237), the Starfish Cluster (M38), and some more stuff. 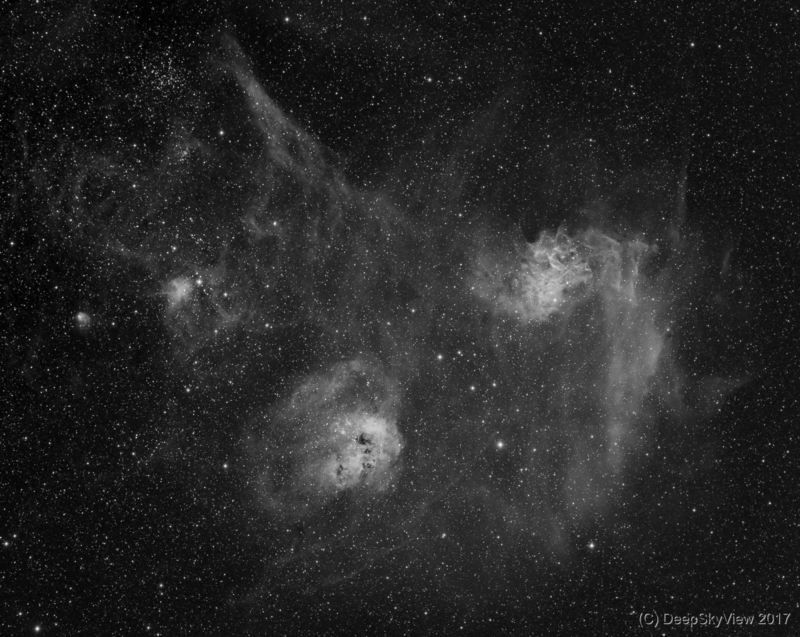 This is a wide field monochrome image using 3 hours of Ha data taken from my backyard in the light-polluted Frankfurt area – Bortle class 7 (red zone). This is the second target with my new Samyang 135mm f/2.0 lens, stopped down to f/2.8 to improve the star shapes in the corners.